Home > US Sports > NFL > Kearsed? This past Sunday Morning the NFC Championship between The Green Bay Packers and The Seattle Seahawks took place. Aaron Rodgers and the Packers were coming off a comeback win against the Dallas Cowboys last week in the divisional round. Their contenders joining them in the NFC championship game were coming off a dominate win themselves against the Carolina Panthers. A late interception returned for a touchdown by strong safety Kam Chancellor sealed the deal for Seattle in their divisional win; meeting the Packers in the conference championship game in Seattle. How would the Packers fare after winning their game against the cowboys on a controversial call, yet according to the NFL rule book the correct call? These two teams met on opening night of the 2014/2015 NFL Season. The Defending Superbowl champions looked to earn their first win and avoid the infamous “Superbowl hangover.” They dominated the Packers in the second half with the final score of 36-16. With this loss we all thought the Packers were in trouble and in for a rough season. With the exception of some hopefuls, a few of them said the Packers season could still be in good shape; because you can’t base a season off one game. This saying is true and says so much and how both teams both met back up in the championship game. With the way the Packers moved the ball balanced on offense in the first half they were only down by one score of a touchdown; then the second half of the game came and they were destroyed on both sides of the ball. Here is the irony of this game in the beginning of the season. The Packers in the beginning of the season looked bad after facing the Seahawks; however after that in their first few games they ended up playing well. The Seahawks on the other hand looked good and their play declined.Seattle started out 3-3 and we all wondered will they reach the playoffs again. Will they make it as 6th seed wild card. Green Bay started out 4-2 and Aaron Rodgers told his fans to R-E-L-A-X! From they’re both teams went 10-4. Each time made the playoffs winning their divisional game and their division.Each team has a fantastic home record in 2015 and overall. Therefore would the Packers crumble under pressure in Seattle? Just like they did in the first game or would they rise up to the occasion. The answer to everyone is they would crumble with what after looked like a 16-0 nothing lead half was cut to a 16-7 lead in the 3 rd quarter. The Packers had their chance to seal the victory and a trip to the Superbowl with knowing an onside kick was coming yet; they blew it and that helped spark Seattle to win the game eventually in overtime after the Packers sent it to overtime with a field goal. This all happened with two teams who had a great home record. The other irony to this game is just like how the game ended is how it started. Jevon Kearse was targeted the first pass of the game for Seattle and dropped it for an in-completion along with others who dropped the ball. Then in the last 3 minutes the Seahawks found a way to take the game into overtime. The first to second play of the game was a 35 yard pass from Wilson to Kearse for the game winning touchdown in overtime. The game ended with the way it started and with the Seahawks actually scoring. 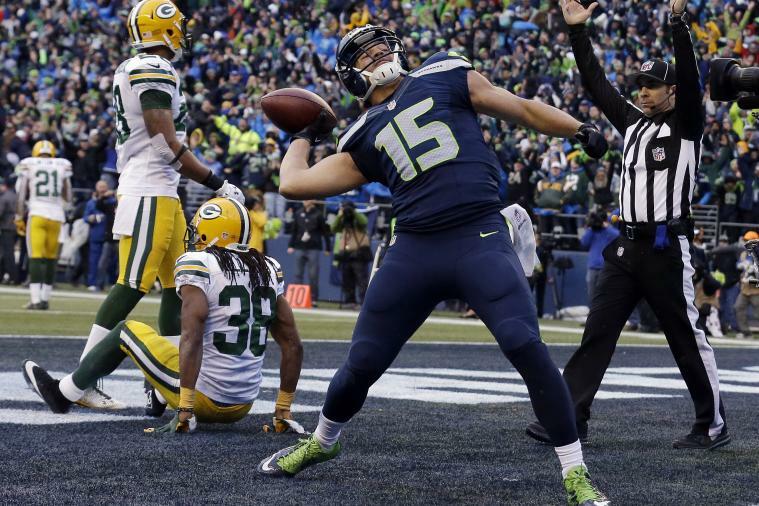 The Seattle Seahawks are 2-0 this year against the Green Bay Packers. The Pack was sent home packing. Ahhhhh..Just like it was yesterday…Huh Caleb? ?